Tastes Of History: Fast Food or Dinner Party? Many of the Roman recipes we have reproduced below are taken from “De re coquinaria” (“On the Subject of Cooking”). 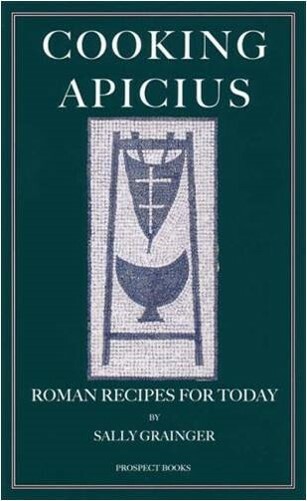 This is a collection of menus, dishes and ingredients attributed to a Roman author (or authors) known to us as “Apicius”. If attribution seems a little vague, it is that we simply do not know, with any certainty, the author. The book may have been dedicated to someone named “Apicius”, which was a popular practice amongst Greek and Roman authors. It may include the works of more than one author, the resulting collection given the eponymous title. The resulting “cook book” is not, however, what we today would recognise as a recipe book. Food and ingredient measurements were basic at best. 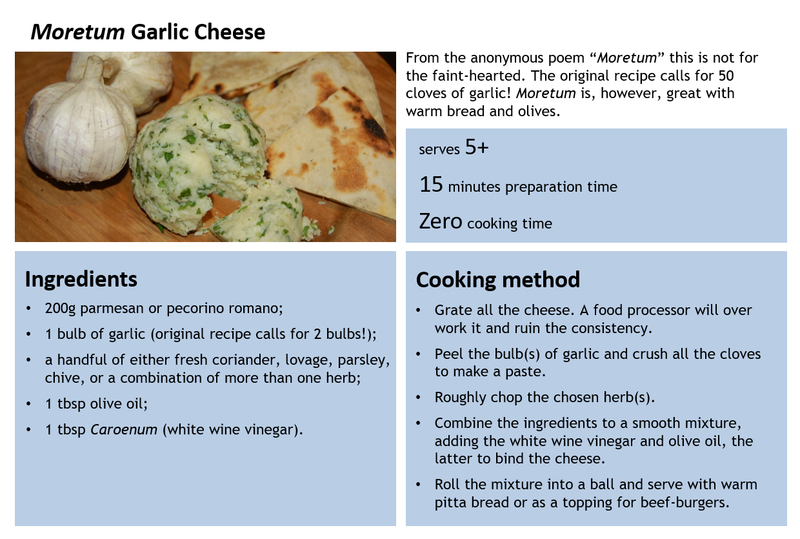 Quantities, for example, were not often given in Roman recipes. Temperature control was difficult and had to be learnt through experience. Thus, cooking temperatures were not specified, and cooking times were equally vague. Much was left to the individual cook to determine from their own knowledge, experience and practice. 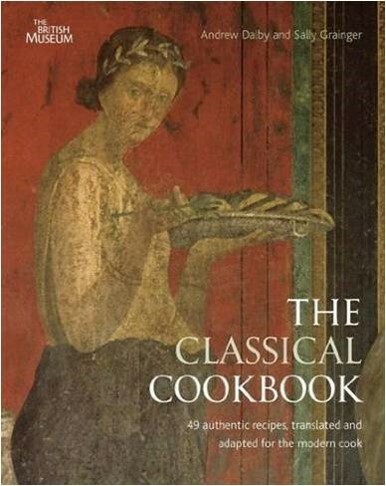 In one convenient volume, Sally Grainger gathers together her interpretations of 64 of Apicius' recipes. The book accompanies, and compliments, the more scholarly work "Apicius" for which Christopher Grocock diligently translated the original Latin text. 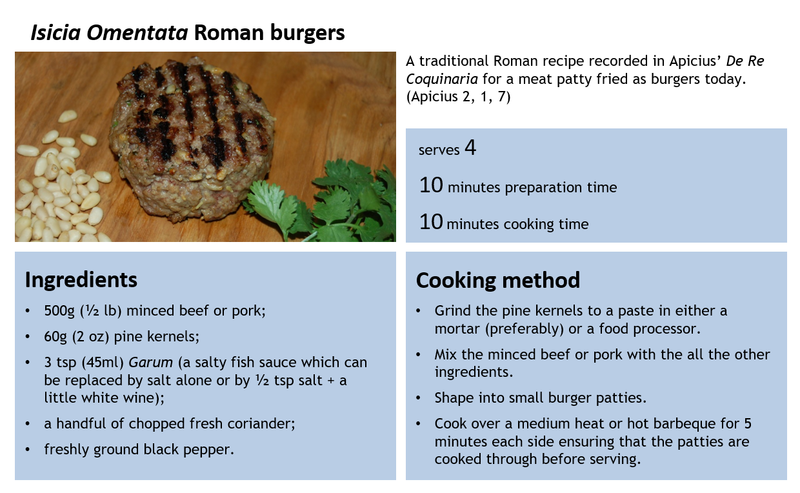 The result is a serious attempt to convert ambiguous Roman instructions into something that can be reproduced in the modern kitchen. Forget lark's tongues and dormice, the book contains more appropriate and affordable dishes such as roast lamb with coriander, carrots or parsnips in a cumin-honey glaze, almond and semolina pudding, to name but a few. 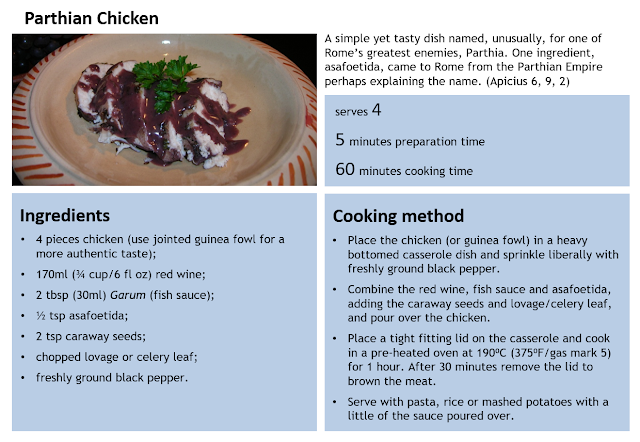 This is an excellent guide to recreating Roman food, with a good selection of dishes and plenty of advice about how to find and make the famous fish sauce. 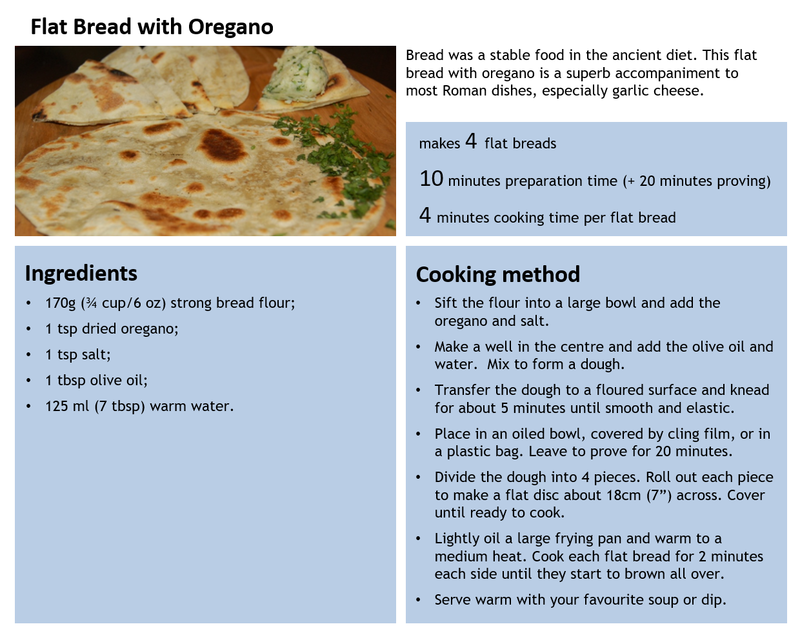 This best-selling cookbook by Andrew Dalby and Sally Grainger features a delicious collection of recipes from every strata of classical civilization, all accessible to the contemporary cook. Using a subtle mix of sweet and sour flavours, fragrant herbs, creamy cheesecakes and hearty red wines, ancient Mediterranean cuisine is brought to life. 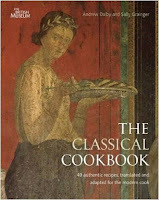 The Classical Cookbook features adaptations of 49 sumptuous dishes. 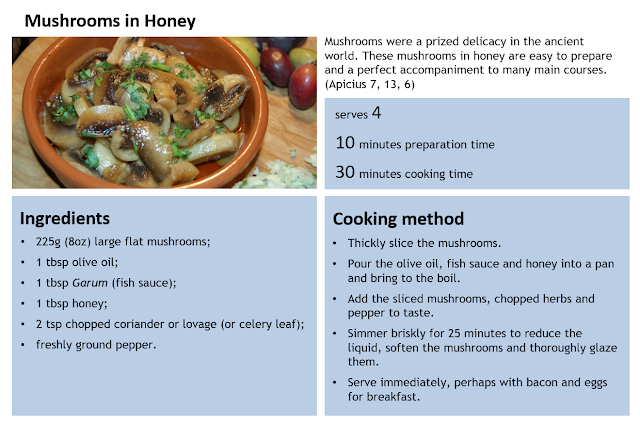 Featuring step-by-step instructions, the modern cook again will be able to tackle everything from simple meals and street food through to lavish banquets and wedding feasts with an authentic Ancient Greek and Roman flair. 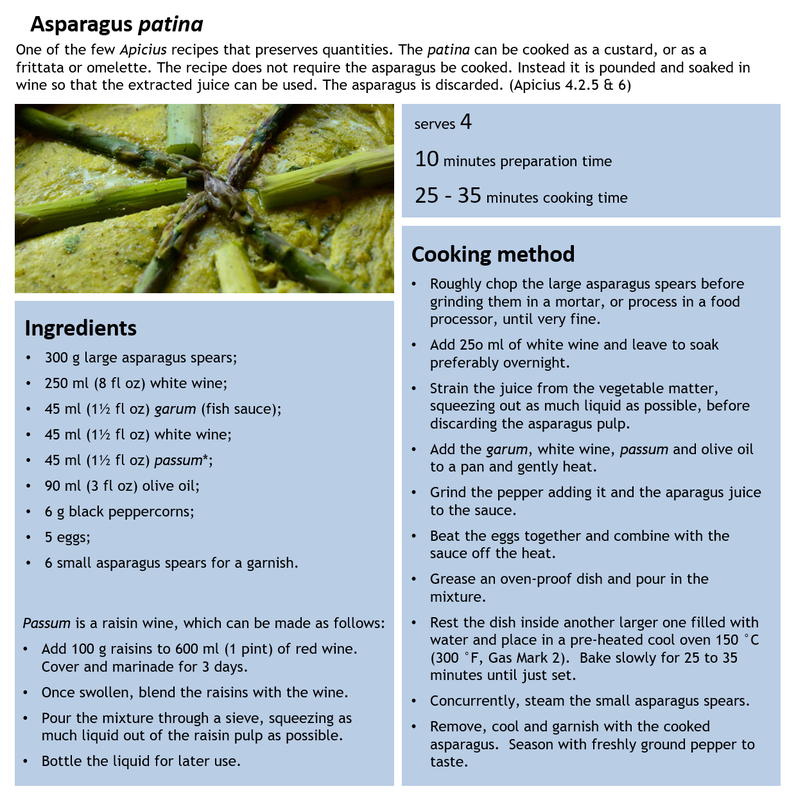 You will undoubtedly find different versions of "Apician" recipes reproduced on many other websites and in books. The selection of recipes that follow, however, are Jill’s adaptations based her own experiments at home and at cookery demonstrations. The dishes, which could form elements of a banquet, have proved very popular with audiences and the members of The Roman Military Research Society. o The best modern replacement for garum is Vietnamese fish sauce available from most supermarkets. Don’t use anchovy essence as it leaves a fishy taste that was simply not present in the original recipes. o A good alternative to lovage (which can be bought as lovage seeds from supermarkets, especially those specialising in Asian cuisine) is finely chopped celery leaf. o None of the ingredients and quantities are set in stone. You will not evoke the wrath of the Gods if you change them. Add more or less to suit your own taste. Have fun experimenting – it’s what we do! 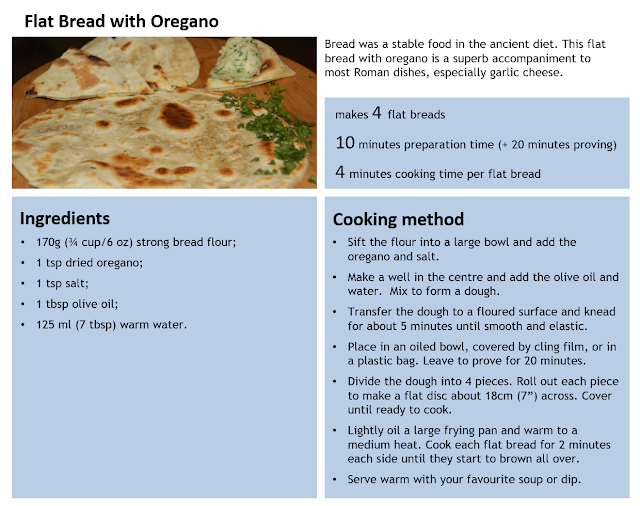 Given the wealth of options available, further Roman recipes will be added at a later date. Or you if you would like more information, then please get in touch.